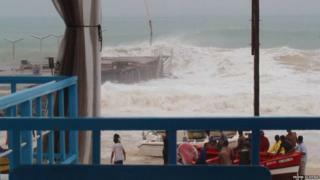 A hurricane with winds of up to 135km/h (85mph) has hit the island nation of Cape Verde, off the coast of West Africa. The government grounded all flights as heavy rain and winds lashed north-western islands in the archipelago. No hurricane has ever been recorded further east in the tropical Atlantic. Late on Monday Fred weakened to a tropical storm as it moved away from the islands, the US-based National Hurricane Center (NHC) said. Strong winds and rain are expected to persist as Fred moves through other parts of Cape Verde on Tuesday, the NHC added. It said the last time a hurricane was recorded hitting Cape Verde was 1892, although it cautions that records were less exact before the advent of weather satellites in the mid-1960s. Cape Verde consists of 10 significant volcanic islands, nine of which are inhabited. Read more about the Cape Verde islands.